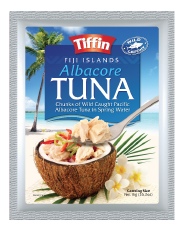 Our Tuna products are sourced from sustainable South Pacific stocks of Yellowfin, Abacore and Wahoo fish. 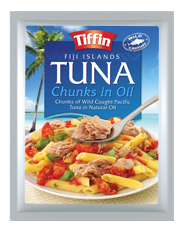 The range includes Tuna chunks, flakes and steaks, which can be mixed with salads, added to pasta or enjoyed as sandwich fillers. The pouches are easy to open, without the hassles of traditional can opening and draining. They also maintain the fresh taste and texture of the fish, and have the same shelf life as canned tuna. 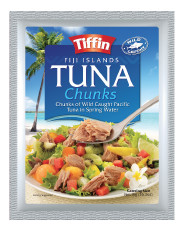 Chunks of Wild Caught Pacific Tuna in Spring Water. 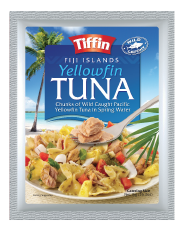 Chunks of Wild Caught Yellowfin Tuna in Spring Water. 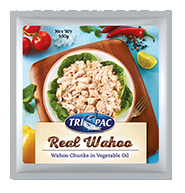 Chunks of Wild Caught Albacore Tuna in Spring Water. Chunks of Wild Caught Wahoo Tuna in Spring Water.